18.3.1919: Launched by Cook, Welton & Gemmell Ltd, Beverley (Yd.No.410) (“Castle” class) for The Admiralty as EGILIAS AKERMAN (Ad.No.4294). 13.11.1919: Completed as a fishing vessel. 1.1920: Sold to Boston Deep Sea Fishing & Ice Co Ltd, Boston. Renamed KESTEVEN (BN146). 1923: Sold to V. Fourney, Boulogne. 1923: Registered at Boulogne as IMPRÉVU (B789). 1930: Sold to Boston Deep Sea Fishing & Ice Co Ltd, Fleetwood (Fred Parkes, Blackpool, manager). 17.3.1930: Registered at Fleetwood as DAILY MIRROR (FD71). 5/6/7.1933: Chartered by Italian Government to provide support for a trans Atlantic flight involving 20 to 30 aeroplanes (Gen. Italo Balbo). 1934: Sold to Thomas L. Devlin & Sons, Granton (Thomas L. Devlin, manager). 5.1934: Registered at Granton as COMPUTATOR (GN42). 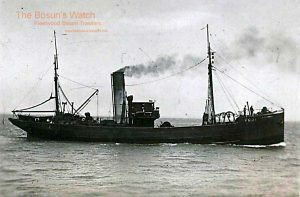 27.3.1937: Stowing gear for trip home in heavy weather 100 miles ENE of Buchan Ness, three crew washed overboard and drowned*. 3.5.1937: Stranded 4 miles N of Buchan Ness. Refloated on next tide. 30.8.1939: Requisitioned for war service as a minesweeper (P.No.FY.635) (Hire rate £89.7.6d/month). 6.1941: Based Portland with M/S Group 49 (Ch Sk. C. W. H. Shearing RNR). 1942: Transferred to Thomas L. Devlin & Sons Ltd, Granton (T. L. Devlin, manager). 21.1.1945: Foundered after collision with HMS VANOC (P.No.H33) in Seine Bay, Normandy. 24/12/2017: Removed FMHT watermark from image. 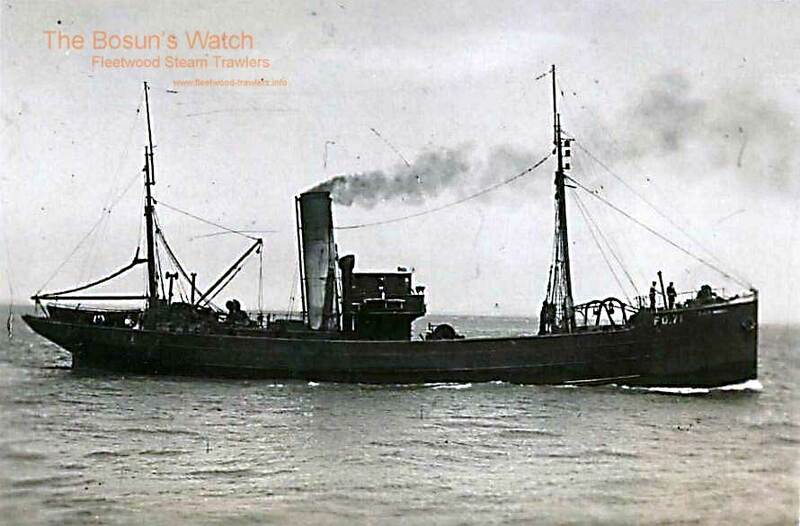 This entry was posted in Lost Vessels, Steam Trawlers, Steamers (Picture), War Losses and tagged Boston DSF & I, Castle, Lost, Parkes, War Loss on May 14, 2012 by Fred Smith.